Life: what is the meaning of life? If we could see as far into the future, as far as we can see into the past, we would realize that life is divine evolution from its primitive origin billions of years ago, into the living shell that surrounds Earth now, streaming from our planet into the universe, towards a mysterious existence, within another billion years. Presently human life can lead to two extremes: [1.] living to the fullest and don't care, while on the other side, [2.] life means starvation until death finally comes to the rescue. In both cases well-being is limited because both extremes know about each other. But if everyone takes responsibility for the development of humanity towards more well-being, life will get a different meaning. LIFE IS ABOUT SUPPORT, TRUST, DEPENDENCIES AND COMMUNICATION. 1. Our planet is supported by the sun's gravity. What happens when the sun is removed? Our planet would drift aimlessly in space. We feel better if we know that we can depend on the sun. 2. The biosphere is supported by the planet. What happens when the planet is removed? There would be no life. We feel better if we know that we can depend on our planet. 3. The biosphere of this planet supports my body. What happens if the biosphere is removed? My body would die. I feel better if I know that I can trust and depend on the biosphere. 4. My body supports my wellbeing. What happens when my body suffers violence? My wellbeing would degrade. I feel better if I know that nothing can harm my body. My wellbeing is the last instance. I want to live a life of wellbeing; that's what I am aiming for. This is a common desire of all human beings and it requires that the chain of support, trust and dependencies is intact and all entities are able to communicate well with each other. Most important, I have to take responsibility for this chain, in the name of my well-being. The status of well-being is communicated between humans. Communication results in human activities. 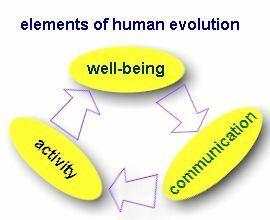 Depending on the type of communication and activity the level of well-being is either increased or decreased. Violent activities decrease well-being. Nourishing activities increase well-being. Put yourself into the shoes of life. Imagine what you would like to achieve if you were the billion-year-old entity of life. What would be your real intention on planet Earth?